How Can I Identify a Thread Type on a Pipe Fitting? Mitutoyo set out to create an affordable, more accurate micrometer, according to the company's history. In the years since its foundation, the company met its original goals for the standard mechanical micrometer and has expanded its offerings to include a much larger variety of measurement instruments, including several types of micrometers. Regardless of the style of a particular Mitutoyo micrometer, the company only offers three basic display readouts: a fixed-line system for mechanical micrometers, an electronic LCD display on digital micrometers and a mechanical digit counter. Mitutoyo mechanical micrometers tend to be cheaper than digital micrometers. Close the micrometer around the object being measured. Tighten the locking nut to prevent the item from moving while reading the micrometer. Read the last visible numbered increment on the stationary barrel sleeve -- not on the rotating thimble. Each numbered line is 0100-inch, so if the "4" is visible but the 5 is not, it means the measurement begins with a 0400-inch value. Count how many unnumbered vertical lines are visible on the barrel sleeve after the last numbered increment. These each represent another 0025 inch. Add this number to the numbered 0100-inch increment. If the "4" and two unnumbered lines are visible on the barrel sleeve, that totals 0450-inch. Check which line on the rotating thimble best aligns with the horizontal datum line on the stationary barrel sleeve. Identify the numerical value next to the line. These numbers represent 0001-inch increments. If the line that best aligns with the datum is labeled "12," that translates to a measurement of 0012-inch. The "4" would be 0004-inch. Add the number from the rotating thimble to the 0100-inch and 0025-inch values on the sleeve. If the "4" and two unnumbered lines are visible on the barrel sleeve for a total of 0450-inch, and the line that best aligns with the horizontal datum is labeled "12," the final measurement for the object would be 0462-inch. 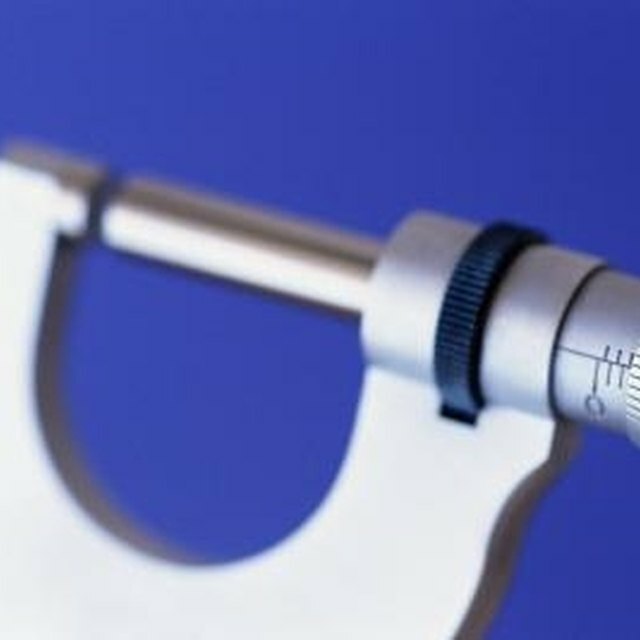 Close the micrometer around the object being measured. Tighten the locking nut to prevent the item from moving while reading the micrometer. Read the measured value of the object on the micrometer's display. What Size Gas Pipe Is Used for Four Appliances?